Home / Astrophysics / Slider / What Sustains The Earth’s Magnetic Field? What Sustains The Earth’s Magnetic Field? Researchers have shed light on how heat is conducted by the inner and outer cores of the Earth to create its protective magnetic field. 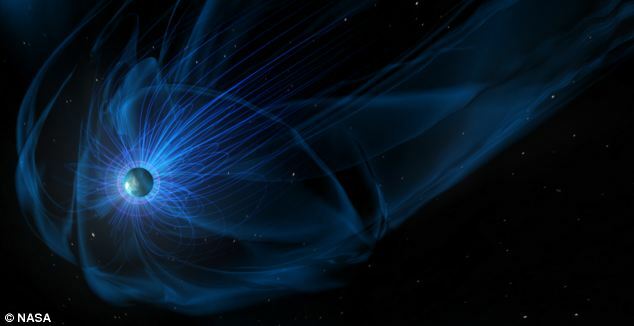 Earth’s magnetic field shields us from deadly cosmic radiation. Without it, life as we know it could not exist. But how it first emerged and was then sustained throughout Earth’s history has remained a mystery to scientists. A team led by Professor Alexander Goncharov at the Institute of Solid State Physics, Hefei Institutes of Physical Science, has shed light on the history of this incredibly important geological occurrence. The results of this research was published in Nature. Our planet is composed of core, mantle and crust. Currently, the inner core is solid iron and the outer core is a liquid iron alloy, the motion of which gives rise to the magnetic field. But how is heat conducted by the solid of the inner core and the liquid in the outer core? The answer needs to piece together the processes of our planet, its magnetic field, and, even more importantly, the energy that sustains a continuous magnetic field. Only under very extreme conditions—very high temperature and very intense pressure—do these materials exist, which means that their behavior is not going to be the same as it is on the surface. Given this situation, his team used a tool called a laser-heated diamond anvil cell to mimic planetary core conditions and study how iron conducts heat under such conditions. The diamond anvil cell squeezes tiny samples of material between two diamonds, mimicking the extreme pressures of the Earth’s interior in the lab. The laser heats the materials to necessary core temperatures. Using this kind of lab-based mimicry, the team could study how the core propagates heat. Through their research, the scientists found that the ability of these iron samples to transmit heat matched the lower end of previous estimates of thermal conductivity in Earth’s core—between 18 and 44 watts per meter per kelvin. This translates to estimates about the energy needed to sustain the geodynamo, or magnetic field, that has been available since very early in the history of Earth. “Our measurement provides an estimation of the Fe thermal conductivity in the limits that allow sustaining the geodynamo and simultaneously making the heat losses consistent with a slow Earth’s cooling,” Goncharov said. Source: Chinese Academy of Sciences; Photo: Kevin Gill/Flickr/CC. Disclaimer: This article does not necessarily reflect the views of AsianScientist or its staff.